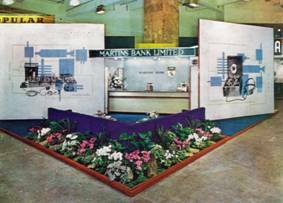 Right from the start of business under its new name in 1928, Martins Bank Limited plans and executes attendance at numerous trade events, and employs bold and imaginatively designed stands. 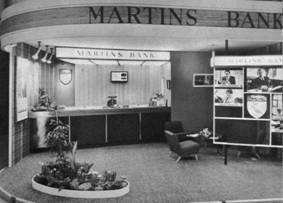 The Bank sets out to establish a feeling of style, confidence and stability, through these carefully placed displays. Each one is different, and built to suit the venue at which it is to be exhibited. Whilst it is undoubtedly expensive to commission a new stand for every show in this way, the returns by way of new business will have more than paid for this. 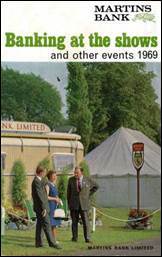 Trade Stands serve both to promote the bank, and provide a service for exhibitors and visitors to the trade fair. 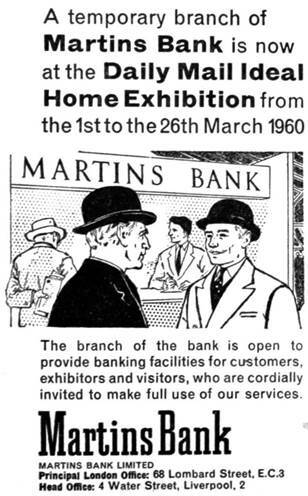 For many of these events, Martins Bank Magazine habitually prints only a photograph of a trade event, deeming it unnecessary to add any written copy. We do trust therefore, that some of the images below will speak for themselves! 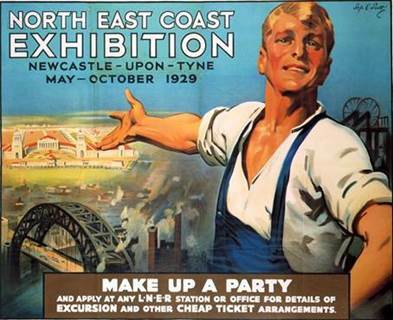 One of the earliest examples of this forward thinking, is not simply having a presence but actually a temporary Branch of the Bank at the NORTH EAST COAST EXHIBITION 1929, (Image (right) © National Museum of Science and Industry Ref: NRM/SSPL) for the six months’ duration of this event. 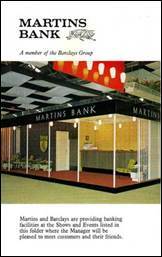 Less than a year after amalgamating with the Lancashire and Yorkshire Bank, the newly named Martins Bank Limited is keen to be noticed! 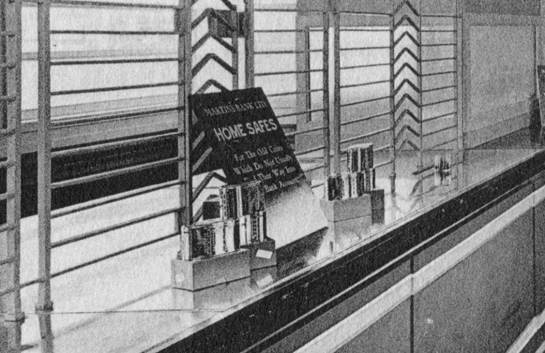 As we move forward in time, you will see advertisements and images from the shows at which the Bank provided a stand or Branch. 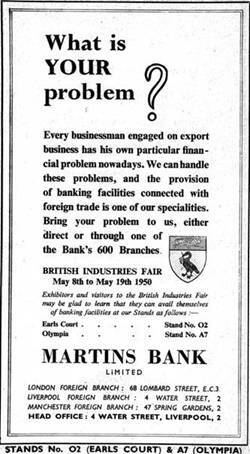 After the Second World War, when exporting goods is on the increase but is also a financial headache, the Bank is offering personal advice in a business setting – a shrewd move, and one that is repeated by placing a stand or temporary branch at many key trade fairs and exhibitions in the years to come. 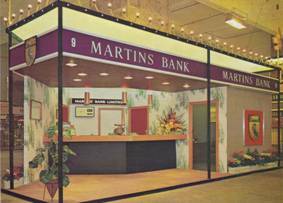 All stands provide a basic banking service, but the real purpose of Martins’ presence is to promote the Bank and its many services to an almost captive audience of business exhibitors. 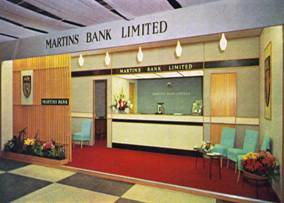 At this point the Bank’s advertising policy still favours the businessman, and those with money to be managed. It will be a number of years before this is turned on its head with the kind of advertising copy that appeals to everyone – from children with pennies to save, to students and those in their first jobs looking for financial advice and guidance. You can read more about this in our ADVERTISING section. We are indebted to Reg Towner, who is an architect with a love of all things Liverpool, for adding the images below to his flickr® page. 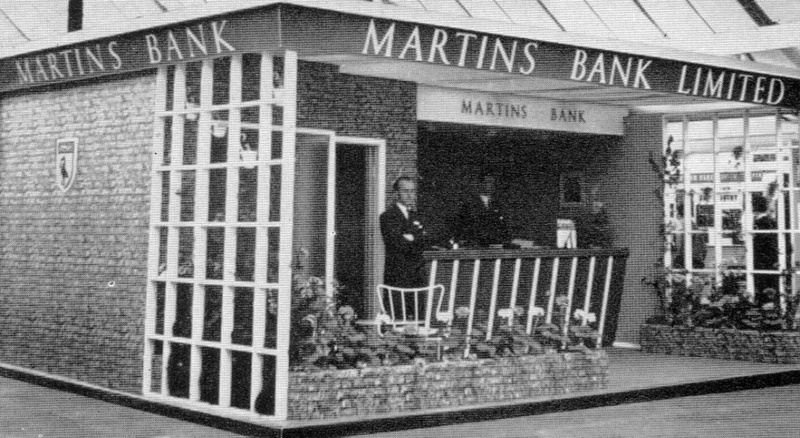 In 1930, Martins Bank commissions a “portable” branch, one that can be used over again and taken to shows and events all over the country. 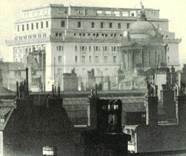 The architect charged with the job of producing this miniature Branch is none other than Herbert J Rowse, who is responsible for the masterpiece that is Martins Bank’s Head Office, at 4 Water Street Liverpool (right). 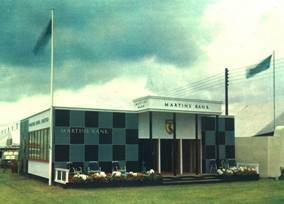 Officially referred to as a “Pavillion” this structure makes its debut at the Royal Agricultural Show, Manchester in July 1930. The design is found and reviewed in a book “The Book of the Liverpool School of Architecture” published in 1932 by Liverpool University Press. 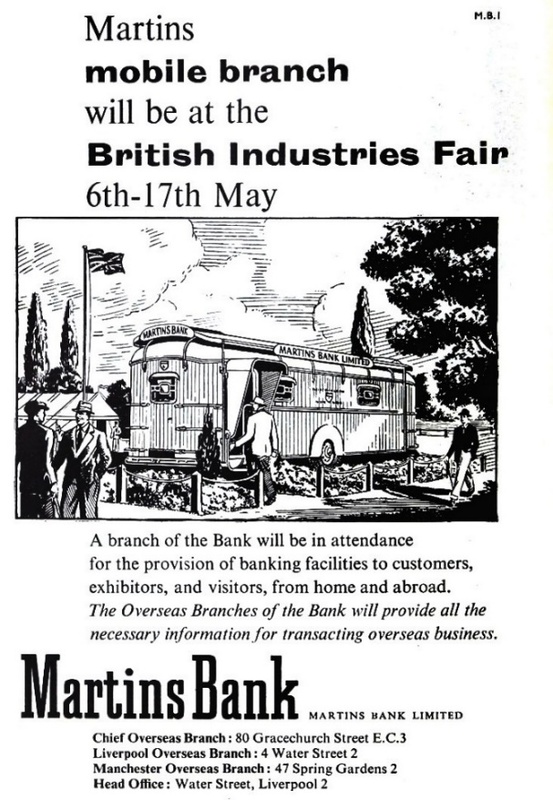 Reg notes that when Herbert J Rowse designed the portable bank, he was “detailing the Mersey Tunnels infrastructure project and his head was full of Egyptian Revival imagery”. 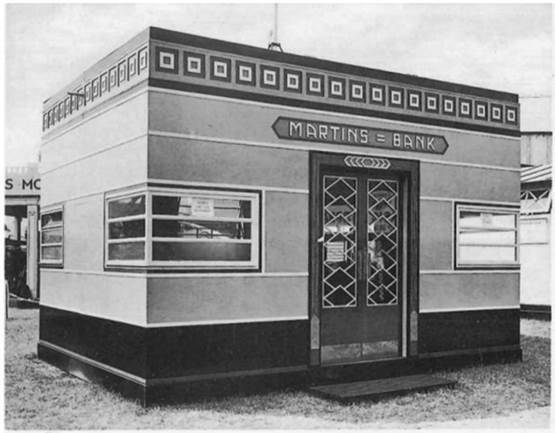 That certainly does seem to be the case, as this art deco bank in a box seems almost mystic in its symbolism! 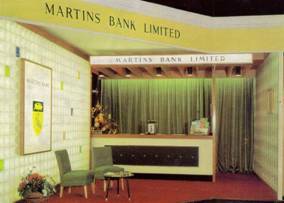 On the inside, a minimally decorated banking hall and counter front. 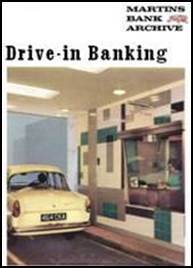 The notice leaning against the counter grille exhorts customers to make use of the Bank’s new metal moneyboxes. 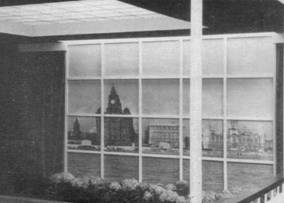 The Bank’s Stand at the British Industries’ Fair at Olympia, reinforces the Bank’s Northern roots with a backdrop of the imposing Liverpool Skyline. 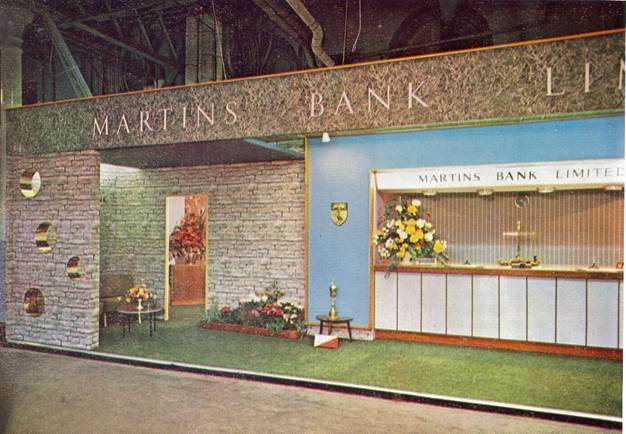 “We are indebted to Mr Gustave Breslauer, a customer of our Kensington High Street branch, and to the Trans World Photographic Company for permission to use this photograph of Martins Bank’s Stand at the Daily Mail Ideal Homes Exhibition 1956”. 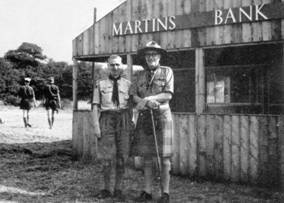 Our staff of Scouts, drawn from the Bank, and interpreters from the Overseas branches, who manned Martins Bank’s Stand at the Jubilee Jamboree in August. 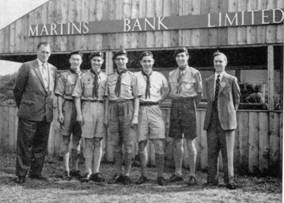 Left to Right: Messrs J S Anderson (Chief Overseas) S H Powell (Stockport) R A Franklin (Worcester) R Roscoe (Manager, Ormskirk) A Atkin (Derby) C D Roscoe (Eastbank Street) and C Holland (Manchester Overseas). 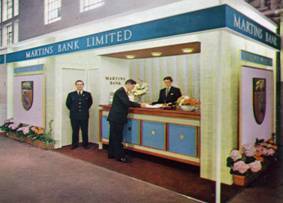 This is Martins Bank’s Stand at the Industry Advances Exhibition held in conjunction with the Liverpool Charter Celebrations. 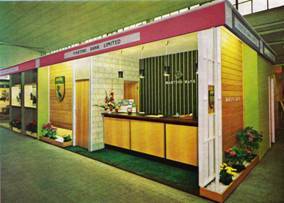 It was designed by Mr Eric Swettenham, of Premises Department, Head Office, and the general décor were most effective and attracted much favourable comment. 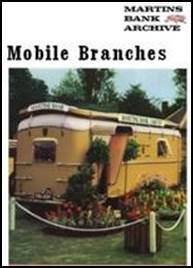 Our temporary Branch at the United Commercial travellers’ Association Conference at Buxton, May 26 to 28. Left to Right: Sir John H Wedgwood, (President of the Conference), Mr W E T Keil (Heaton Chapel branch, Clerk in Charge of our branch at the Conference), Mayor of Buxton (Councillor Grahame E Motion) and Mr C Wilson (Buxton Branch). 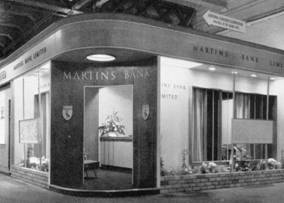 This photograph shows a portion of Martins Bank’s Stand at the Dairy Show Olympia 1959 which was adjudged the best Trade Stand on the Ground, First and Second Floors of the Exhibition and was awarded the Sir William Rootes Perpetual Challenge Trophy. Our Stand at the Dairy Show at Olympia this year was adjudged the best Trade Stand on the Ground, First and Second floors of the Exhibition and was awarded the Sir William Rootes Perpetual Challenge Trophy. 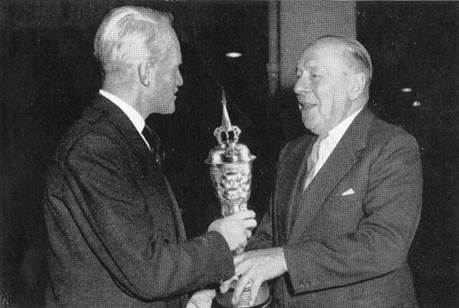 Our photograph, reproduced by courtesy of the Farmer and Stock-Breeder, shows the Cup being presented to Mr. Tom Blossom, who was in charge of the Stand, by the Chairman of Farmer and Stock-Breeder Publications Ltd., Sir Richard Haddon, C.B.E. 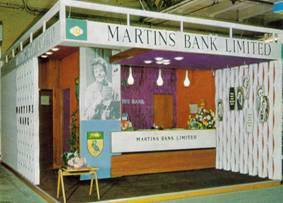 Martins Bank’s Stand at the Ideal Home Exhibition. Our team at the first Teesside Boys’ and Girls’ Exhibition. 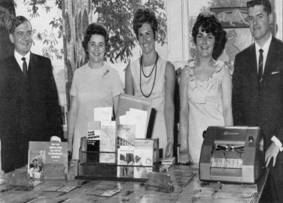 From the left: Malcolm Johnson, Margaret Glendinning (North Eastern District Lady Supervisor) Moira Douglas, Mary O’Keefe, and William Park. 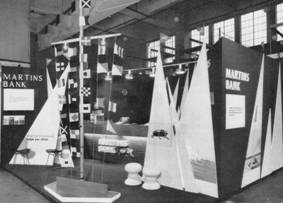 The signal hoisted on Martins Bank’s Stand at the 1969 International Boat Show at Earls Court captured the interest of the sailing fraternity. 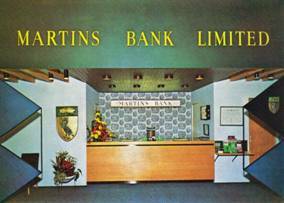 The message reads “Martins go to extremes to be helpful” … so we are assured.